Reflections on being found guilty of disrupting Matt Ridley's coal mine. On Wednesday, along with seven accomplices, I declared myself guilty. On 26th October I took part in an action at Shotton open cast coal mine in Northumberland, the largest in England. The site’s sole entrance usually greets a coal lorry every three minutes. It was blockaded for eight hours. 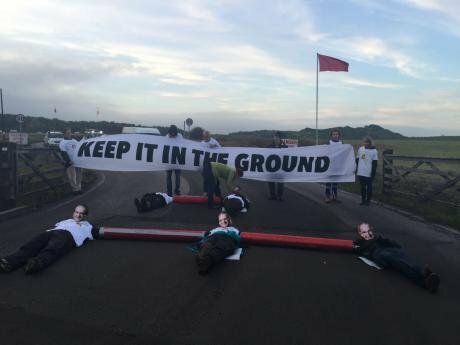 This was an effective piece of direct action against a mine that is a major contributor to climate disaster, and a powerful statement against the climate–denying Times columnist, Viscount Matt Ridley, that owns the site. In his honour, we carried out the action as ‘Matt Ridley’s Conscience’. In the days preceding yesterday’s hearing I felt angry, helpless, defeated. I am guilty of nothing, I insisted. Yet legally, the case against us was strong. Declaring ourselves guilty in court avoided us a potentially lengthy, stressful and costly trial. It was a sensible decision. At first that good sense left a bad taste in my mouth. But a system of crime and punishment designed by and for the class that this climate–endangering economic system serves can be no reflection of ethics. Immoral laws do not recognise principled stances. Matt Ridley’s Conscience declared itself guilty. Matt Ridley’s actions keep us awake at night, they play upon our mind constantly. The coal profits filling his bank account come wet with the blood of those killed and displaced by the climate disaster his mines contribute to. But we feel no guilt for the actions we took on 26th October to stop the climate violence caused by Shotton open cast coal mine. We trespassed upon Matt’s inherited land, his personal fiefdom. His estate represents centuries of brutal coal capital passed down with his surname, those that worked the mines that funded the estate inheriting nothing. His wealth is upheld and defended by his influence as a Times columnist, a member of the House of Lords and brother–in–law and one–time speechwriter for disgraced ex–Environment Secretary Owen Paterson. This pattern of injustice repeats itself across the globe. It is the structural root of climate change: the undemocratic control of land by colonialists and capitalists, exploited for their own private interests, profiting enough to be able to insure themselves against the damage they cause to our common wealth, our environment. They insure themselves by controlling the law, by controlling the media. Our entirely peaceful action stopped climate violence. Yet the Crown prosecutes us while Ridley and Banks Mining Group are deemed ‘lawful’ in undermining the ecosystem upon which the wellbeing of all human communities depends. Ridley was (…again) offered a platform on BBC Radio 4 just a week before our hearing, despite his views being roundly debunked by climate scientists. The legal process efficiently served its function of bureaucratising our struggle, making us attempt to justify our actions in terms of the state’s narrow, violent logic. The ethics of our action are so clear, and declaring myself guilty felt like folding to that. We found ourselves depressed and demoralised, swamped in legal paperwork. Pleading guilty frees us from the stress of a court case, allowing us to focus on more effective arenas of struggle. That reflection makes me even more convinced of the rightness of our actions. Climate violence strikes along imperialist lines, with those least responsible, those already most disadvantaged by colonial capitalism, feeling the worst impacts. Those are the people that lead our struggle, but are often also the most vulnerable to repression in the struggle. When fighting alongside those who find themselves at many more intersections of the law’s oppression than I do, I have a responsibility to volunteer first when we need to face up to the police and the state.